The most common detected pathogen from the eye is bacteria. The techniques have not changed much over the last 40 years although the bacterial nomenclature has changed with genera and species. The areas that are frequently infected with bacteria are the conjunctiva (conjunctivitis), eyelids (blepharitis), cornea (keratitis), and the aqueous and vitreous inside the eye (endophthalmitis). The cornea, aqueous, and vitreous are not inhabited with bacteria. The normal conjunctiva contains no colonizing bacteria but probably is continuously contaminated with flora from the eyelids. The eyelids are colonized with numerous amounts of coagulase negative Staphylococci, diphtheroids, and an occasional Staphylococcus aureus, Streptococcus viridans, and gram-negative bacteria. The most important culture media for isolation of bacteria from ocular locations are 1) 5% sheep's blood agar, 2) chocolate agar, and 3) mannitol salt agar. 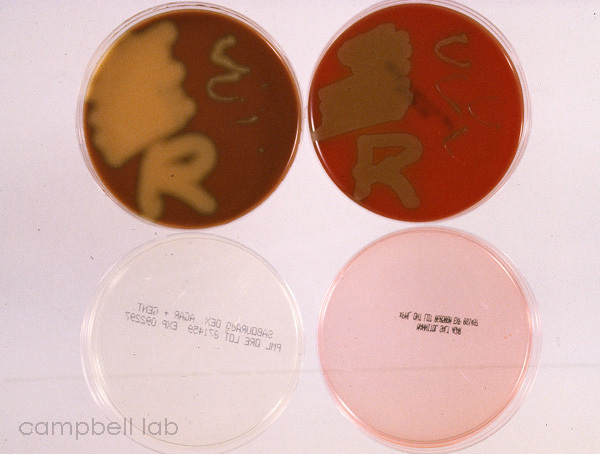 Most bacteria can be isolated on the 5% sheep's blood, but chocolate agar is necessary to isolate Haemophilus species, and nutritionally variant Streptococcus species that are frequent pathogens of conjunctivitis and keratitis. Neisseria gonorrhoeae also requires chocolate agar. Mannitol salt, if available, is helpful to the microbiologist for rapidly identifying Staphylococcus isolates. Anaerobic bacteria are rare pathogens of the eye. The most frequent anaerobic pathogen is Propionibacterium acnes that is suspected in chronic endophthalmitis after phaco-cataract extraction surgery. Propionibacterium acnes is most efficiently isolated in enriched thioglycollate, and 5% sheep's blood and chocolate agars incubated anaerobically. When unusual bacterial pathogens (anaerobic bacteria, mycobacteria, nocardia, etc.) are suspected, physicians must make arrangements with the laboratory to assure that the appropriate media is plated and incubated properly. Ocular specimens from conjunctivitis and blepharitis are easily collected with soft-tipped applicators (i.e. cotton, Dacron, or calcium alginate swabs). Prior to collection, the soft-tipped applicators are moistened with laboratory-supplied broth but any non-preserved sterile medium (i.e. PBS, BSS) would suffice. Many ophthalmologists apply a topical anesthetic (0.5% proparacaine) prior to obtaining a sample but this may not be necessary for most patients presenting with conjunctivitis and blepharitis. Although rare, some patients may react to the anesthetic. All patients should be dissuaded from rubbing their numb eyes, and all patients should be informed of the devastating consequences of repeated instillation of these anesthetics for pain. Conjunctival cultures are obtained by lowering the bottom eyelid and applying the moistened applicator to the lower bulbar conjunctiva for about 5 seconds without touching the eyelid margin. The eyelid margins are cultured similarly by applying the moistened applicator to the eyelashes and margins of both top and bottom eyelids. It is good practice to culture the conjunctiva and eyelid of both eyes in cases of conjunctivitis and blepharitis, even if only one eye is symptomatic. Conjunctiva and eyelid specimens can be plated on the same agar medium, but the laboratory must be able to distinguish between the plants. In general, squiggles for conjunctiva above the letters R or L for eyelids are appropriate for distinguishing the location of cultures on one plate. Transport swabs (culturettes) can also be used but should be properly marked with sample location. The transport media should be delivered quickly to the laboratory for media plantation. Culturing of the cornea is more delicate and should be performed by an ophthalmologist or experienced physician. A specimen obtained from a thin cornea by an inexperienced person could lead to a perforated cornea. Generally the bacteria are located at the leading edge of an ulcer or infiltrate, and the specimen is obtained with a spatula, blade, or jeweler's forceps. A corneal specimen could also be obtained by meticulously dabbing the infected area with a soft-tipped applicator. Topical anesthetic should always be applied prior to obtaining a corneal specimen. Corneal specimens can be plated on the same agar media with the conjunctiva and eyelid specimens. A general convention is to form Cs on the media designating the cornea. Breaking the surface of the agar occurs quite often and is acceptable. Transport swabs (culturettes) can also be used but should be properly marked with sample location. The transport media should be delivered quickly to the laboratory for media plantation. Intraocular infection is a serious sight threatening disease. Endophthalmitis generally occurs after surgery (i.e. cataract, keratoplasty) but can occur after trauma, perforation after severe bacterial keratitis, and from an endogenous systemic infection. Specimens are obtained with a syringe and needle by an experienced ophthalmologist who is aware of all intraocular complications. These specimens are aqueous and vitreous fluids that are immediately planted separately on 5% sheep's blood agar, chocolate agar, sabourauds agar with gentamicin, anaerobic agar medium, and enriched thioglycollate. A few drops of aqueous and vitreous should be placed on glass slides for gram and giemsa stains. The drops should not be spread over the slide like a blood smear. Vitrectomy specimens are often cultured after endophthalmitis. These specimens are vitreous diluted with large volumes of BSSplus (50 to 100 ml). Vitrectomy specimens are concentrated by centrifuging at 3000rpm for 30 minutes. The pellet can be aliquotted onto slides for staining, and to culture media for microbial isolation. Suspended matter in the diluted vitreous sample could be fished-out, placed on a glass slide, and stained for the examination of organisms. This is especially advantageous for a rapid laboratory diagnosis of Propionibacterium acnes and fungi.